Simplified, intuitive operation and increased productivity are only two of the essential advantages the AS 1200 offers. The control algorithm optimized to the needs and requirements of decorative anodizing guarantees shortest process times. The industrial graphics-enabled touch panel supports intuitive operation. Additional process information is displayed as numerical values and trend lines on the screen. The digital interface facilitates the integration of the device into a modern Ethernet-based network. This ensures flawless data exchange between production and order management. Optional functions allow for an online production control via digital interface not only at the PC but also on mobile devices. More power in an even smaller space, this is another feature of the AS 1200 compared to the successful previous generation. 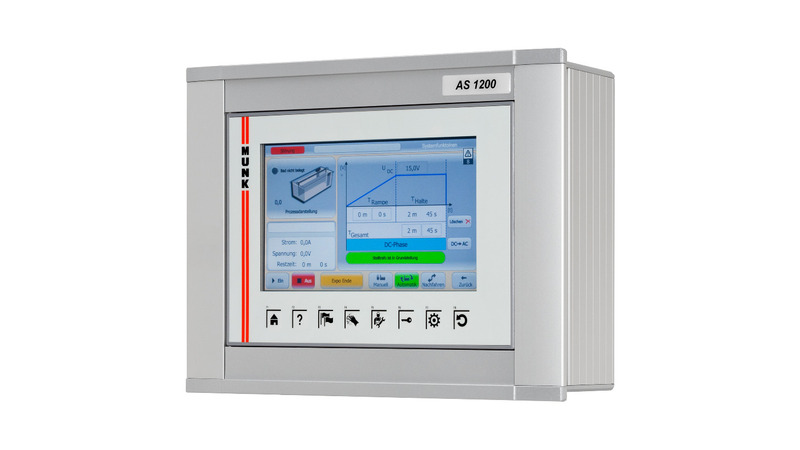 Hardly bigger than the 9-inches screen, the AS 1200 can be installed almost everywhere.